Kim Kardashian and Kanye West might have only just welcomed first baby, daughter North, but according to a new report they're already desperate to add another member to their growing family insiders claim. Baby North arrived on June 15 to much excitement and it seems parents Kim and Kanye are natural parents with both gushing about just how much they adore their daughter. So it shouldn't be too much of a surprise that they want to extend their family, insiders claim. “Kim is already talking about having another baby. She wants her children to be close in age, and she would love for baby North to have a little brother or sister,” a friend reportedly told HollywoodLife. 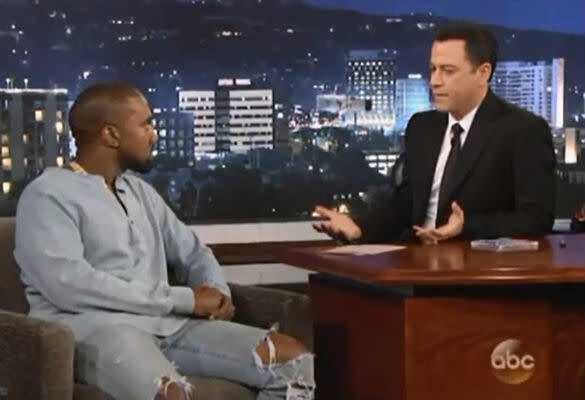 Kanye recently gushed about the new arrival while appearing on Jimmy Kimmel Live. Showing off his softer side the 36 year-old spoke passionately about what he really cared about - his new baby North, who was born in June and her mum Kim. "I wouldn't even say I'm a rapper," he told Kimmel. "I would say that I'm a messenger. In all honesty, all I care about is my family, protecting my girl, protecting my dreams." We'd love Kimye to have another baby - especially as little North, known as Nori, is so cute. But we're not so sure Kim would want to get pregnant again just yet as she didn't exactly enjoy it the first time round. The 31 year-old claimed in a series of interviews that she had thought pregnancy would be alot easier than she'd found it.